Green light for a while has been seen as unused light by many people as it is not used by chlorophylls a and b, the main drivers of plant growth. Plants were seen to discard this unused light, colouring plants green. 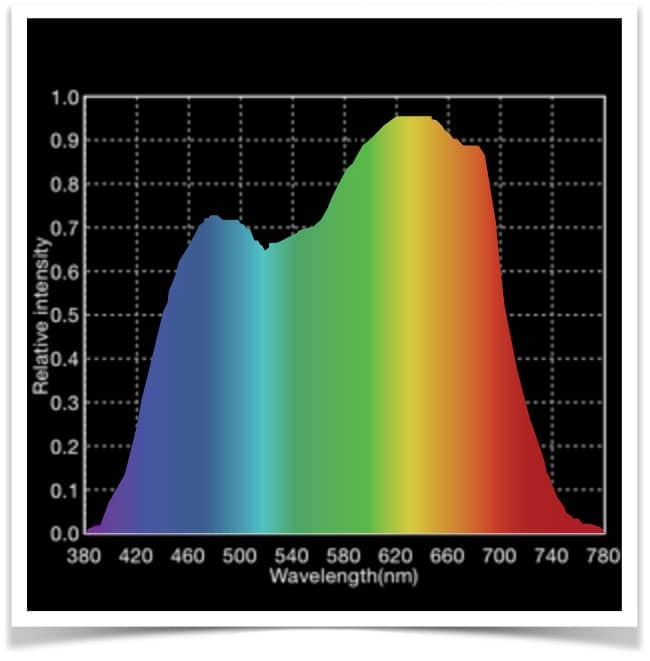 Many LED growlights avoided the green spectrum entirely and sold only blue and red LEDs in their lights. However, plants have been proven to grow with ONLY green light, how can this be? The truth is more complex. A McCree study in 1972 studied the relative quantum yields of the photosynthetic spectrum and found that a mixture of light, with large quantities of green, produced the most photosynthetic output. However, later research found that photo pigments within the plant tissue absorb this green light and excite/de-excite out other photons such as red or blue. This means that a larger spectrum of light is used by plant, equating to the entire visible spectrum. Therefore, there is no such thing as ‘waste light’ within the visible spectrum. However, the distribution of the delivered spectrum does heavily influence growth patterns. Moreover, green light works in some plants to tell it that it is surrounded by other plants and needs a longer stem to break out, typically using the phytochrome mechanism, as does red and far-red light. Cryptochromes are also stimulated by green light to some degree, sometimes reversing blue light driven elongation inhibitory action (see article blue and red light). Due to this, plants have at least two reliable ways to break through from the crowd, look for green light AND examine the red/far-red phytochrome balance (see article phytochrome manipulation). Moreover, Cope and Bugbee explored the importance of green light for plant growth and development and explained that green light permeates deeper into the plant, further than red and blue, and therefore provides additional photosynthesis beyond the red/blue top leaf saturation levels. In lettuce grow with pure green light, the plant grew albeit weakly, surprising since many thought green light to be not used in the past, but in combination with red and blue light, the RGB grown lettuce was the most vigorous and healthy among all different combinations of light at the same PPFD levels. They did highlight that this benefit of green light is species dependent, as some plants lack the photopigments and phytochemicals to deal with green light, whereas many do. Heliochrome is a newly discovered phytochemical that involves far-red/green balance similar to the phytochromes far-red/red, and offers an additional function for plants to influence their circadian rhythm based on incident light. Its influences are being carefully studied at this time. Lastly, green light induces physiological changes to plant morphogenesis; it makes leaves wider and encourages benign stomatal closing. NASA ran tests on growlights and found that a full spectrum of red-blue-green produced more dry mass of crop than purely red-blue, indicating green light’s ability to deliver yields. This was found to be because the plant was already saturated with red and blue light; therefore, a balance including green was more efficient in carbon fixation in photosynthesis. This agrees with McCree’s 1972 study that found a heavy showing of green in a mixed spectrum to produce the most photosynthetic activity. Green light is definitely required for a rich and healthy light spectrum, missing it out reduces growth and yield, as plants at light saturation would not benefit from the additional energy. Plants also use green light to set their circadian rhythm through phytochrome, cryptochrome and heliochrome, meaning that it is an essential component of plant growth control. At excite we include white LEDs that emit a full spectrum with plenty of green presence, this allows the high PPFD to deliver more growth at levels of saturation that any other type of light that misses green out.